Monte Rosa has always represented a point of interest for its natural beauty, inspiring many great figures including poets, authors, painters, naturalists and, above all, alpinists. It is known that in the early 500s, Leonardo da Vinci adventured onto the slopes of Monboso (Monte Rosa). The origin of this name comes from the ancient Celtic name, "ro�se�, "roiza�, "rovesa�, meaning glacier. The first true recorded ascent of Monte Rosa dates back to 1778; the "Roccia della Scoperta� near the Lys Col, was climbed by seven alpinists from Gressoney, Valentino and Joseph Beck, Sebastian Linty, Joseph Zumstein, Nicolas Vincent, Fran�ois Castel and Etienne Lisco. 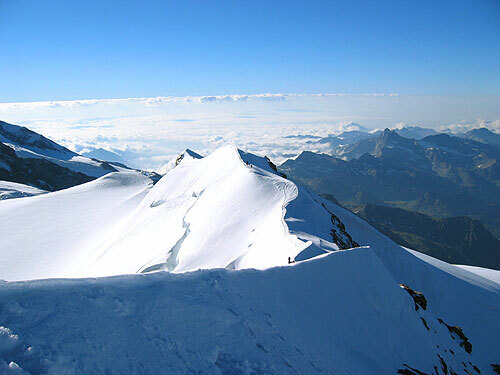 The subsequent climbs on the massif were also led by alpinists from Gressoney; in 1819 Nicolas and Joseph Vincent claimed the peak which then took their name (Vincent Pyramid). 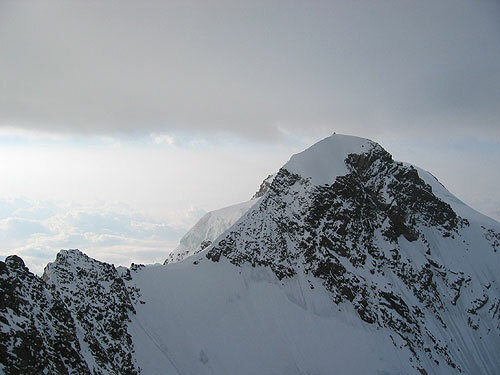 In the same year, Nicolas Vincent and Joseph Zumstein reached the 4561-metre peak which is now known as the Zumstein spitz. In 1893, the Gressoney guides accompanied Her Majesty the Queen Margherita of Savoia to the opening ceremony of the highest observatory hut in Europe, which was named after her. Later, there were many first ascents completed by the Gressoney guides. In 1902, there was the first ascent of the south-east face of the Western Lyskamm by the guides, Franceso Curta, Giacomo Davide and Alessandro Lazier. In 1903, the guides, Curtaz and Pellissier, along with Mrs Grace Filder, opened a new route on the south-east face of Western Lyskamm, which was then given the name, "via Filder� (the Filder route). In 1907, the first winter ascent of Dufour peak place with the guides Antonio Curtaz and Franz Lazier who accompanied the alpinist Mario Piacenza. Then, in 1911, the first Italian ascent of the north face of Lyskamm and the first ascent of the south-west ridge of Castore were completed by the the guide Antonio Welf along with his client, Carlo Fortina. The Society of the Gressoney Alpine Guides was founded in 1963.